Two weeks ago a new car entered my life. This is hardly novel for me, as I’ve owned over 50 different new/used cars in my comparatively short lifetime. Yet this car’s purchase is a huge milestone for me. It marks the most expensive, advanced, and powerful car I’ve ever owned. Though I’ve driven cars of similar horsepower, they were not mine. 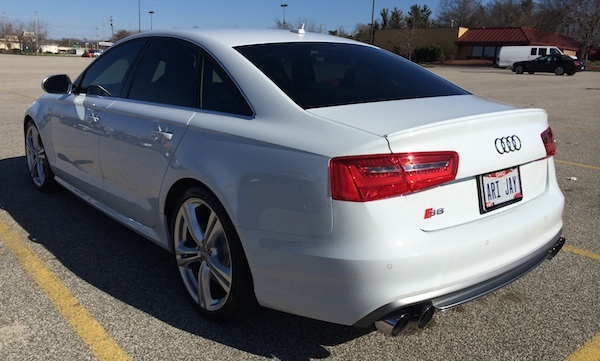 Here is my review of my first two weeks owning a 2014 Audi S6. Around the turn of the New Year I had started to get an all too familiar itch. 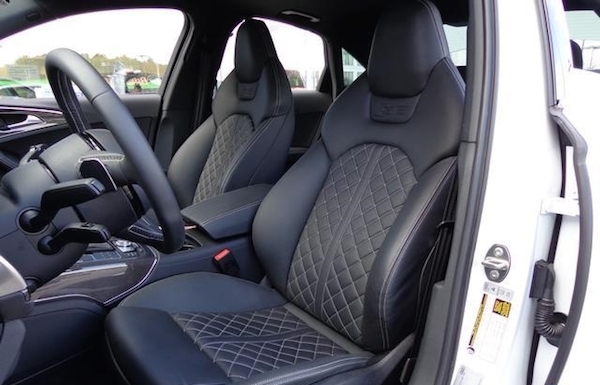 It was nearing a year with my 2012 Volkswagen Touareg TDI which seems to be my usual “period” with my cars before I start looking to change it up. In an attempt to keep myself happy I even did some wheel dealing, as can be seen in my Avant Garde wheels HERE. 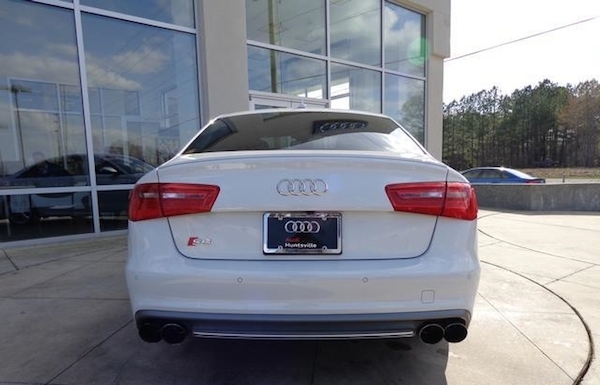 But in the end the bug bit me, and I started shopping for an Audi S6 or S7, the latter being my preference purely for the styling, though the pricing would prove to make the S6 the better bargain. I’m no stranger to the Volkswagen/Audi community having had over 25 of my 50 some cars be from those two manufacturers. Likewise I’ve been behind the wheel of a few Italian exotics in my day, and have felt the adrenaline rush of 500+ horsepower at your finger tips. If I was going to leave my APR-chipped SUV for a sports sedan it needed to be a step up, and when you’re coming from that truck you’ve already got a nice piece of hardware. Researching the Audi, BMW and Mercedes-Benz lineup quickly resulted in finding THIS COMPARISON ARTICLE, which was easy to swallow seeing as I’m already brand-loyal to Audi. From there I dug deeper into the S6/S7 reviews, finding a few great articles. My favorite being MASHABLE’S REVIEW, namely because I’m a tech/gadget geek (LOVE the Vine video clip!) Other reviews that inspired me to continue the search for a used S6/S7 were from TTAC and Motor Trend. It seemed that no matter where I turned I found another great review singing the praise of these cars, with the C7-chassis winning awards for interior, styling, and luxury. Finding an affordable (used) S6/S7 was proving difficult in the Midwest region, so my search quickly expanded to anywhere east of the Mississippi. For me to make this happen it needed to be a cosmic alignment of price, value, color, options, and timing. It had to be white (Ibis or Glacier, didn’t care). No wood trim, please. Full LED headlights are a must, as is the Driver Assistance Package. No comfort seats (blech!) — and no black optics — neither offered performance or looks I wanted. Black headliner was a must, suede or cloth version didn’t matter to me. Loved the 20″ wheels but didn’t need them. And the Bang & Olufsen upgraded sound system seemed overpriced at $5,900! Definitely not a feature I’d option out if I was ordering new. Option-wise the S6 you see here checked all the boxes I wanted, and added a few bonus features, though it did require a 10-hour drive to reach down south. It is Glacier White over black and has the Drivers Assistance, LED headlights, and black cloth headliner. Additionally it has Carbon Atlas inlays, 20″ 5-parallel wheels, and the B&O stereo system. That last feature is one that I’m most appreciative of since it was an item I wasn’t actually looking for, but wow! But more on that in a bit…. Beyond the list of options, which already made this car attractive, were two other key elements that made the purchase a dream come true. First off were the three modifications already on the car which I’ll touch down on later in this review. Secondly was that the sale price reflected a 15% discount off original MSRP, making this one of the most affordable S6 vehicles on the market especially with the mods. Icing on the cake: it was only 5-months old bearing only 3,200 miles at pickup… yeah you get the idea! 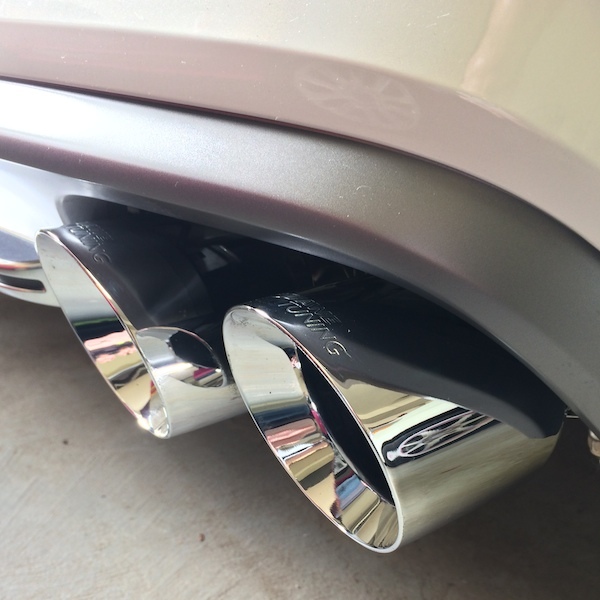 EXHAUST: As seen above, the car wears the AWE Tuning S6 Touring Edition Exhaust. Words cannot describe the sweetness that is the exhaust note– check out the video on that link, and then wipe off the drool. It is loud when you want it, subtle otherwise. At times it is too subdued, but for a family hauler it is proper and perfect. And expensive, making it a highly valued accessory to this car. ECU UPGRADE: When you look at the motor photo above what you cannot see is the APR 4.0 TFSI V8 ECU Upgrade. But what you can’t see you can definitely feel when you drive the car. I’ll expand on the driving experience in a moment, but for sake of discussion here is what APR publishes for 93-octane performance…. 560 HP and 580 TQ at the crank. 0-60 in 3.52 seconds, with a standing quarter in 11.628 seconds at 117.83 miles per hour. Eek!! WINDOW TINT: All the side windows and rear have been tinted to a modest value. On a white car this really sets it off nicely, with just a touch of darkness. It also helps make the S6 brushed accents pop ever so slightly more. This is where I’m supposed to tell you that is goes like a raped ape. How it snaps your neck back and pushes you into the seat. But you already knew that, if by the power figures alone. What you may not realize is that this car is big, at 4,400 pounds of aluminum, steel, and composites. But at no point during any type of driving has the car truly felt hefty. Last week my wife drove the car (and we all survived!) 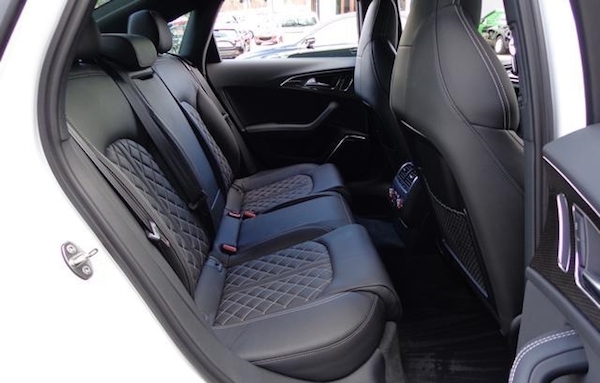 — and her words described the car as “surprisingly nimble” … “didn’t feel like a tank like our old (C6) A6 wagon” … and she noted how it felt connected to the pavement, with a great vantage of the road. My wife is definitely a “car girl” — but she would be happy to argue some of my cars were too harsh. She was happy to say that the car drove sportily while never being too harsh– which is high praise given her disdain for prior-owned modified cars. Hopefully this car, when lowered slightly (see later in article) won’t become harsh — others have said it remains compliant. To say the car is fast is an understatement. It handles great in the real world, which is where most drivers are going to find themselves. I’ve watched enough video reviews to know the car tends to push in the corners on a road course, but I don’t suspect I’ll find that an issue. Though I do hope to make it onto a road course with this car at least once down the road. I’m more likely to make a test-and-tune drag strip day, just so I can see what the launch control is all about. My experiences thus far on public roads have been positive, with no signs of understeer or disconnect. Drop the car into Sport mode (transmission) and you’re instantly rewarded to the AWE exhaust which gurgles with downshifts, growls and howls with acceleration, and rewards at virtually any RPM. Place the car back in drive and the exhaust is almost unnoticed, save for those moments where you find yourself at 75% throttle. This is great for hauling my wife/kid around, giving me a chance to control when I have the power, and the sound. I do wish AWE had utilized the “flappers” the stock exhaust did, but frankly it wouldn’t have probably been worth the time or cost– it works great as-is. If I was going to fault anything about the car it would be the brakes. They are amazing, but hard to modulate. The first bit of travel lacks grab, but when you do reach bite it comes swiftly and without great foot-feel. If you’re hard on the brakes, however, they do a superb job biting down and bringing speed to a halt. Just could use a bit firmer pedal is all. Last but not least, the APR ECU upgrade came with the car but was the original software version. With a quick visit to HS Tuning last week we got the car upgraded to also allow for their APR Mobile dongle. This allows easy switching between EMCS programs, plus their Anti-Theft and Security Lockout features. There is also DTC reading and data logging, though I doubt I’ll have much use for those items. Thanks to Hurley and staff for the hospitality and the warranty transfer! During my shopping I said to myself whatever car I buy next must have adaptive cruise control. I’ve wanted that feature since it first was unveiled over a dozen years ago, first seen in the US on a Lexus according to Wikipedia. What this car adds beyond that is nothing short of amazing. As noted in the Mashable article linked earlier, the cruise can handle full start/stop traffic. Add the lane assist that can actually steer the car to keep you in your lane and you’ve practically got a self-driving car. It is easy to see that progression, and I understand now better than ever where the future lies. With the cameras and sensors on this car it already pretty much drives itself in a freeway setting. Once V2V technology comes into play it is easy to see how auto-pilot type modes on the expressway will work. And short of a car making turns on local roads, which this car COULD do with the right programming and navigation, we’re already there! Sidebar: Google recently released some interesting data, and most importantly videos showing a bit of how their self-driving cars work. Check out THIS ARTICLE for more details. It has taken a bit of a transition to become accustomed to the “self-driving” nature that occurs. You still need to input steering as the car doesn’t ALWAYS catch the lane markers, and even if it does it often will warn you to retake the steering wheel. It does a fine job with not hitting the car in front of you, but you often will prefer to change lanes and go around the car. So to say this car is self-driving is not true– it is, however, assisting you. And that is what Audi calls those features… driving “assistance” features. Other tech worth nothing is again the amazing B&O stereo, a pricey option but one that offers wonderful acoustics. And those tweeters that pop up out of the dash, so fun! The LED lights are just amazing, though I do feel my Touareg’s lights did a better job “turning” around corners. Another slick touch is the LED lighting inside the car, which dims up/down as you turn things on/off— neat. There are online features such as Google Maps and such, but my SIM card was missing from the car at time of purchase. Audi Connect is sending me a new SIM card, so I’m still awaiting the arrival of that. In the meantime the voice control has worked to my satisfaction, and the quality of the Bluetooth module has proven far better than that of my Volkswagen. My only complaint in the Technology department are the controls for the MMI. Being short, they are too far back — I’d prefer them either beside the shifter, or up on the dash. And a touch screen would be nice too! 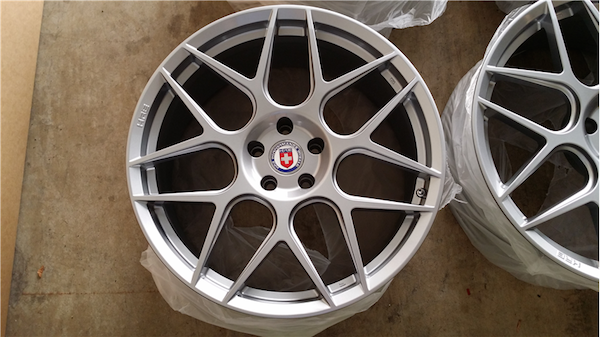 ABOVE: HRE FF01 20×9 wheels, coming soon! Honestly there isn’t much left to be desired when it comes to a car like this. There are cars which accelerate faster or handle better. But for this money there isn’t much that you can touch. To get a faster 4-door sports sedan would require a BMW M5 Gran Coupe, Audi RS7, or Porsche Panamera Turbo. All of those cars start north of six-figures and can be more than 2x the cost of the S6 when optioned out with all the fixin’s you want. 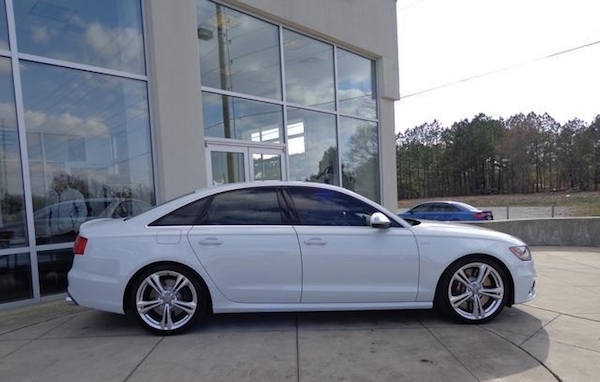 It isn’t often that I say this but really, the S6 is the perfect car, though definitely pricey. And it is not often that you’ll be able to use all the power at your finger tips, but when you can, it is fun! Also in the works is a slight lowering/drop. From the factory the car does allow adjustability swapping between Comfort and Dynamic mode, but even in the latter it would be nice to see a little less fender gap. Rather than spending nearly $2k for the H&R ETS lowering module, I’ve ordered a set of Airmatic Lowering Links instead which works mechanically instead of electronically, but provides the same features as the H&R unit. Once the wheels and suspension links are installed I’ll be sure to post another blog feature. I’ve also got a dyno day scheduled for May 10th, so sometime after all of that I’ll have a follow-up article to talk more about the power it put down, and showcase the new ride height and wheel setup. Hopefully by then I’ll also be able to elaborate on the Google features (Audi Connect) once my SIM card arrives. I’m thankful to have the opportunity to enjoy this car, and hope those reading this post share my passion for all things automotive. Thanks for reading, and have a great day! Wow!!!!! !So about how much all in was it to get the apr upgrade? How long did the install take? Lucky for me the APR chip was already installed, so the only thing HS Tuning locally had to do was reflash the new software version. That took about 15 minutes total, not long at all. When buying the chip new it may take longer I am not sure. They run $1499 but often are discounted/on special — check http://www.goapr.com for more details and for an installer near you. Does the APR chip void the manufacturer warranty ?? Audi can deny warranty work for any modification that may have caused a failure but the answer is far more complex than that. Visit goapr.com and ask them for more details to get a deeper explanation. No faults or issues (tho be aware I no longer have this car as I only tend to keep cars a year LOL) but during my ownership it was flawless. Dealer was aware I had modified the car so they advised we not have them plug their computer in to avoid being noted on account as could be warranty issue. I suggest having a candid conversation with your service manager about this before chipping. Enjoy your car!